Robot vacuum cleaners have become a favorite purchase nowadays. This is because they will help you keep an area clean without you doing much. The thing is, there are many models out there, so it could be a bit difficult to determine which model best suits your needs. Because of that, we took 2 of the most popular robot vacuums in the market, the Roomba 690 and the Roomba 890, and we put each one of these models to the test. As you will see, each model has many features that one can find interesting. But at the end of the day, there can only be one winner! Right? To begin with, we will give you a small review on each of the models, so you have a better idea of what we are working with. Roomba 690 vs 890 – Which Should You Buy? For starters, we have the Roomba 690. This has become a favorite among many customers – thanks to its price range. It is not only wallet-friendly, but it is also one of the best models you can get in that price range. It may not have any features the advanced models have but still has some interesting features. To begin with, we should talk about controls and maneuverability. It uses the iAdapt 1.0 navigation technology to move around a certain space. Additionally, it includes a virtual wall barrier to limit or expand the cleaning space. Although it may not have a memory feature, you can still program it via Wi-Fi. This model possesses a simple but useful bristle style brush roll. You may be familiar with this brush since it is the same one most Roombas have. This brush is easy to clean and will pick up almost every particle that crosses its path. This particular model has an AeroVac filtration system. It is bigger, which means that takes more space in the dustbin, making it fill faster than usual. But this also means that it can filtrate for a longer time, and you don’t need to change as regularly as you would typically do. You will find that it is not that expensive. The first thing that you can notice when you look at the 690 is the light green accent on top of it. This accent matches perfectly with the grey and black color scheme of the whole Roomba. You can also see a glimpse of the light green accent near the dustbin release button. The whole model has four main buttons that you can find either on top of it or the sides of the model. Its central button is located just in the center, which is used to trigger the auto-clean cycle. This center button is surrounded by another two smaller buttons which are used to configure the cleaning pattern. When you are looking for a Roomba, you want it to have the best cleaning technology there is. The cleaning technique varies between Roombas, which makes you choose a model depending on your needs. In this occasion, we can see that the 690 brandishes a bristle brush roll. There is no rocket science behind these spinning bristle brush rolls. The side brushes guide the debris to the main bristle brush roll, which gathers the same trash and allows the vacuum to take it into the dustbin. These brush rolls are not expensive, and you will spend less than two minutes replacing them. Since this model does not have an advanced cleaning feature, it counts with a dirt detection system which directs the model where the debris is. If the sensors detect an area that is dirtier than usual, they make the model spend more time on this specific area. This model comes with a few accessories that are worth mentioning. You will notice that these are the same accessories that come with almost any Roomba model on the market. AeroVac Filter: This model includes one AeroVac filter that can be installed inside the dustbin to confine most harmful particles inside of it. Charging Station: This is where the Roomba will go if it has finished cleaning a room (or if it runs out of battery). Wall Barrier: This item can be used to keep the 690 out of specific areas. This means that once the Roomba gets close to it, the sensors will send it in the opposite direction. Brush Roll Cleaning Tool: This comb can be used to release any debris that could get stuck on the bristles. The Wi-Fi connectivity that is included in this model makes it much easier to use. It saves you some time since you can configure it through your phone. You can also set it manually, but the app is much easier to use. Once you put it all together, you can have this model running in a few minutes. Once you are finished with the configuration, you can launch the Roomba through the app or manually by pressing the “Clean” button which is at the center of the model. Just make sure that you check on the model regularly since it may get stuck. When comparing the two models, it is evident that the 690 will need a bit more maintenance, but it may be a bit cheaper. The bristle brush roll is more likely to get stuck with hairs, so after a few rounds, you may have to clean it by hand. The good thing is, these brush rolls are cheap to replace. Additionally, you may have to change the filters a few times a year. It is not a HEPA filter, which makes it a tad more budget-friendly. Yeah, it may be a bit larger than average, but for a great price, you get a decent filtration. On the other side, we have the Roomba 890. Although a bit more expensive, the different features of this model will ensure a more thorough cleaning. Since it is more expensive, you should expect a few features that you won’t usually see on other Roombas. This type of model is better for you if you are trying to clean a large room or many rooms. This model offers a few features that we did not see on the 690. For example, this model does offer Wi-Fi connectivity, and voice controls. But additionally, it provides a memory mapping feature which ensures that every single corner space is cleaned. As you can surely remember, the last model had standard bristle brushes. These tend to get stuck on hairs, and even if they are easy to clean its not a fun task. This model, on the other hand, has advanced dual brush rolls. These are less likely to get stuck, and they provide a more thorough cleaning. Finally, the filtration system. This model can brag a HEPA Filtration system which is attached to an AeroForce filter. This filter is smaller than usual, but this allows the bin to fill up with more debris before you need to clean it up. You may have to change it more constantly, but the bin will not fill up as fast. It is much more expensive than the 690. When you compare both models, you will notice that there is not a significant difference in the design. As a matter a fact, other than the color scheme, they are the same. The 890 has a darker color scheme which makes look a bit more elegant. Also, you can notice that there is no light-colored accent anywhere on the model. The button configuration is the same as well. For example, the central button is also in the center and is still surrounded by the configuration buttons. You will notice that this design is widespread among several Roomba models. Again, the Roomba 890 has a design that resembles that of the 690. It still counts with the same steps for picking up debris, except for the dual brush rolls instead of the bristle brush rolls. And the main difference of these brush rolls is that they are less likely to get tangled. Dual brush rolls are a bit more on the expensive side, but they are easy to clean and to change as well. This model has a greater vacuuming power, meaning that it will gather more debris in fewer laps. This makes the higher price on the model worthwhile. Additionally, since it also has a memory-mapping system, you can be sure that every corner of the room is cleaned up. This system will also guarantee that the Roomba will not fall off starts or bump into any obstacles. As we mentioned earlier, most Roombas come with the same accessories, but the 890 might be an exception. It lacks the brush roll cleaning tool, which can be a good sign. Maybe this is a way of letting you know that the advanced dual brush rolls are so good, you won’t need a cleaning tool to release any stuck debris. AeroForce Filter: This model includes one AeroForce HEPA filter. Although smaller, the filter is better at catching harmful particles. Charging Station: Once the Roomba has finished cleaning a room or if it’s running out of battery, it will cruise to this charging station. Wall Barrier: Again, this is used to keep the Roomba inside (or outside) a specific area. Again, we can see some traits of the 690 usabilities on the 890. To begin with, it possesses the same Wi-Fi connectivity. Still, you just need to register the model, and in a few minutes, you can have it running. The app is simple to use, so you can be sure you won’t have any problem with it. The controls are pretty intuitive. They don’t have any complicated instructions, and basically, anyone can set it up, even without the app. Plus, you don’t need to babysit this model since its advanced maneuverability keeps it from bumping into furniture. The 890 on the other hand, needs less maintenance, but it will be a bit more expensive. This is because the advanced dual brush rolls are less likely to get stuck with pet hairs, but they are considerably costlier. This model also has a HEPA filtration system. Since the model uses an AeroForce system instead of an AeroVac system (which can be found on the 690), the filters are a bit smaller. Because of this, there is a chance that you will spend more money on the overall maintenance. To determine the final winner, we had to compare each model side by side and see in which categories each one shines. We chose the categories based on what a user would like to have (better maneuverability, better cleaning, better design etc.). 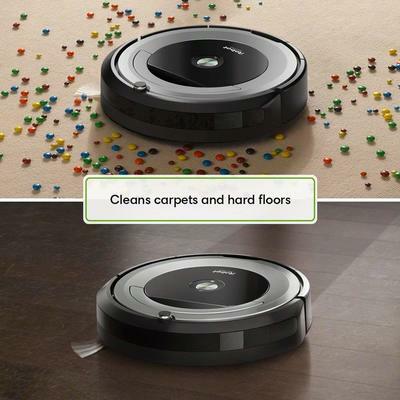 Now you can compare roomba 690 and 890, which is perfect for your home or office. As you may already know, these models can be great for different scenarios. But at the end of the day, there can only be one definite winner. And for general household use, we found that the Roomba 890 is the best choice. Although this model is a bit more expensive than the 690, you won’t regret purchasing it. This model has an advanced mapping system, which ensures a thorough cleaning. Plus, it is less likely to get stuck, which means that you don’t have to clean the brush roll every time it cleans a room. A Roomba primarily uses four mechanisms of operation. If you watch a Roomba in operation, you will think that the device is following a random pattern. Well, it does most of the time. This, it does by moving around the walls of a room and clean the room corners with its flailing brush. This is called the wall-following movement. The second mechanism is the random bounce; where it cleans moving randomly in any direction after hitting an obstacle in the room- cleaning process. The latest version of Roombas comes with wifi connectivity, which allows you to program the device from wherever you may be, using your phone or from your tablet. The Roombas will be taking footages of the room in operation, using onboard fixed cameras to keep track of the areas they have covered and where they should be heading. The sensors are to help the Roombas detect and slow down whenever they come close to a wall or an obstacle. The bumper will stop the Roomba whenever it hits anything. How To Clean Roomba 960? The first step is to empty the Roomba. On the rear end of the Roomba, there is a tray, and this is the tray that filled with the dirt, and it should be cleaned from time to time. The second step is to remove the filter. The filter of a Roomba is usually semi-circle, and it is easy to slide out of the tray. The third step is to attach the crevice tool to the nose of the vacuum cleaner. Then turn it on and use the attachment to remove dirt from the Roomba 960. Finally, switch Roomba to the brush tool. At this point, remove the crevice tool from the vacuum hose. The vacuum should be turned to the backside so that the tray and the filter can be accessed easily. Remember, the surface of the screen should be given more attention to ensure that all the dirt has been removed. How To Clean Roomba Filter? If the filter has some dust, it is advisable to use a brush. A brush paint should be applied, and this is because the scrub is gentle and it will not destroy some parts of the Roomba. After performing this task, a damp sponge should be used, and this will mainly help to remove the stubborn dust. A filter should not be placed under the tap because this might break the screen. How Much Dirt Does A Roomba Hold? A Roomba will keep enough dirt for a day. After this, the Roomba should be emptied every night. Emptying a Roomba is not an easy task, and this will take a lot of time. Most of the Roombas are capable of cleaning multiple rooms, and this is possible because the Roombas can hold more dirt. When the storage compartment is full, a light will come ON; this indicates you should empty it ASAP. Roomba 650 is mainly designed for cleaning thick carpet, hardwood, tiles, and the laminate floors. These Roombas are also capable of picking a pet’s hair. Due to the strong suction, the Roomba is capable of cleaning thick carpets and sucking the dust. Roomba also has the aggressive beater bar which mainly helps to flip open the carpet piles. This will help enhance the deep cleaning of the dust that is present in the carpet. Roomba also passes many times over the small area, and this helps to clean the carpet more deeply. These are designed in such a way that they consume minimum energy. Therefore, they would go over a small area many times before the battery is dead. Does Roomba Work On Hardwood Floors? Yes! With the iAdapt navigation feature and Aero force feature, Roomba 860 is designed such a way that it can clean the hardwood floor. This makes it possible to clean all the hardwood floors. It has the sensors that allow it to avoid objects and other obstacles that might be present in the room. This type of the Roomba may find its way under the furniture, and it will make several passes in a small area. And this will enable Roomba to clean the hardwood floor. Thus, Roomba 890 is capable of cleaning all the floor types. Does Roomba Remember Room Layout? Ever since Roombas were invented, no model has ever remembered the room layout. For some Roombas, once their battery entirely consumed, they are capable of charging themselves and resuming the work where they had left. When it comes to the floor layout, older models can’t map the room. The most recent Roombas can map out of the place once it is allocated. However, these types of Roombas are too expensive. Older Roombas use an array of sensors, and therefore, they cannot map the room. Roombas are engineered to munch the minimum energy. Therefore, they would go over a small area many times before the battery dies. If you practice certain code of conducts, the battery can last for an extended period. For the general use, a Roomba lasts for 2 to 5 years with proper care. This means the battery will live up to 400 battery cycle count. So, the answer entirely depends on the frequency of use. The more frequent you use and discharge the battery, the more it loses its life. Still, a rough calculation could estimate 1 to 2 years of regular use. Depending on how you behave with the machine, you may face a replacement sooner than you have expected. And, it is absolutely a norm. It is essential to keep the Roomba plugged in when not in use. This will help improve the battery life. How Do I Turn Off The Schedule On My Roomba? Scheduling a Roomba to clean while you are doing other tasks will help to save on time. The scheduling features are installed in Roomba 500 and 560 series. If one wants to turn off the schedule, first of all, he/she should press and hold on the schedule, and while holding on the schedule, press the day button. While on the date button, one can opt to turn off the cleaning time. The last step is to release the schedule. With the proper care, one Roomba battery can last for hundreds of cleaning cycles before replacing it. The battery replacement is the same procedure for 500 and the 600 series. The first step is to remove the side brush screw and the side brush. Next, you have to pull open the four screws which will enable you to remove the bottom cover. Lastly, take out the old battery and then install the new one. Get the screws back on their places, set the side brush and its screw. You are done! The most important thing is that you get the model you need. If you are looking for a wallet-friendly model that can clean any room, the 690 is the best option for you. In case you are looking for a more efficient model regardless of the price, then the 890 is the definite winner. Just make sure that you consider every aspect of a robot vacuum before you purchase it since this will determine if you are going to use it or it will just gather dust on the back of a closet. So, tell me which Roomba model did you like the best?